Trust is a highly valued asset at Porter® Paints which is why, since 1921; we have endeavored to provide our customers a quality experience in both product and service by consistently delivering on promises. 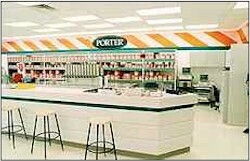 Part of the PPG family of products, Porter® benefits from the purchasing power of an $11 billion global coatings leader. Porter® and PPG clearly understand the need for a wide range of products and ensure quality raw materials are used to produce items with comparable price points. The Porter® Paints brand is committed to delivering quality products and guarantees your satisfaction with every purchase.